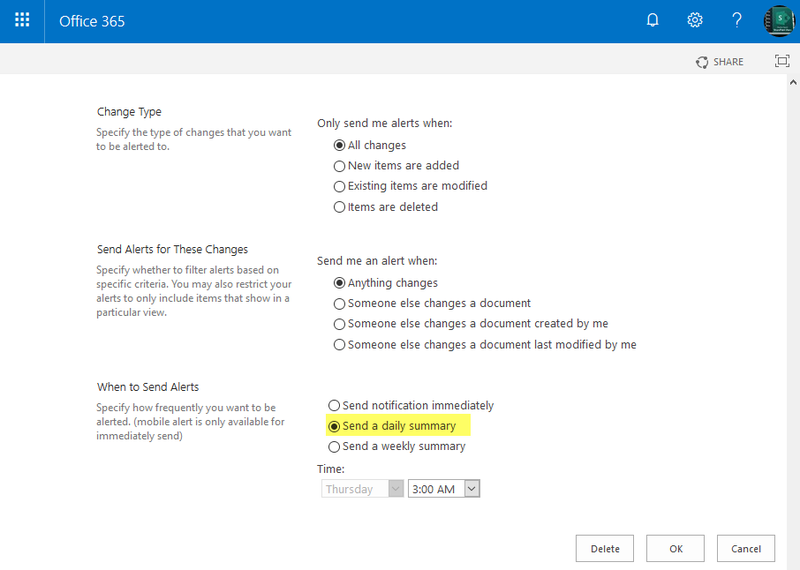 Requirement: Change the Alert Schedule from "Immediate" to "Daily" for all alerts of a specific user in a SharePoint Online site collection. Business Case: A SharePoint User subscribed for alerts in various lists and libraries in a SharePoint Online site collection. Alerts were created with "Immediate" frequency which resulted in flooding his Inbox, as content added to these SharePoint Lists frequently. So the user wants to change the alert frequency to daily summary for all alerts he has created. How to change alert frequency from immediate to daily in SharePoint? Go to the list or library where you have the alert created >> Click on "Manage My Alerts" from list settings toolbar. Pick the alert from the list of alerts shown, to open it in edit mode. Now you can adjust any property of the alert such as frequency, schedule, change type, etc. Updating each alert in a large site collection isn't really an easy task, isn't it? So, lets use PowerShell to update all alerts of an User in SharePoint Online site collection. Lets use PowerShell to change the schedule of all alerts of a particular user in SharePoint Online site collection. Write-host -f Yellow "Searching Site '$SiteURL' for Alerts of the User '$UserID'"
Write-host -f Green "Alert '$($Alert.Title)' Updated on list '$($Alert.List.Title)'!" Set-SPOAlertSchedule -SiteURL $Subweb.url -UserID $UserID -Schedule "Daily"
Set-SPOAlertSchedule -SiteURL "https://crescenttech.sharepoint.com/" -UserID "Salaudeen@TheCrescentTech.com" -Schedule "Daily"